“How to Train Your Dragon” drops the audience smack dab into the middle of a Viking village and the life of a scrawny kid named Hiccup (voiced by Jay Baruchel). These Vikings aren’t so much into plundering as they are dealing with dragons. Dragons infest their tiny island and all good Vikings devote their lives to the hunting of and defense against these sheep stealing beasts. This is where problems arise for Hiccup. Hiccup is less the Village Idiot, more the Village Misunderstood Visionary. His lack of size and strength prevents him from taking on the dragons head to head, but what he lacks in brute strength, he makes up for in technological advances. One of his inventions allows him to take down a dreaded Night Terror dragon, something no one else in the village has ever done. Unfortunately the beast lands somewhere in the distance and no one in the town, especially his father Stoick (Gerard Butler), believes him. Determined to prove his worth, Hiccup tracks down the dragon to finish him off. When the time comes, however, he finds himself unable to do so and eventually finds himself forming a very unlikely friendship. Everything about “Dragon” is solid. The voice work is strong and I must say these characters are extremely well cast. Too often animated movies rely on “name” talent that is designed to get people into the theater but then forces you to focus on those well known voices. Here, however, the work done by Baruchel, Butler, and the rest feels genuine. You’re not distracted by the voices as they just seem like a bunch of real cartoon Vikings (as weird as that description may sound). In addition, the visuals are excellent even if the 3-D aspect is a bit unnecessary. The design of the dragons is an especially nice touch. 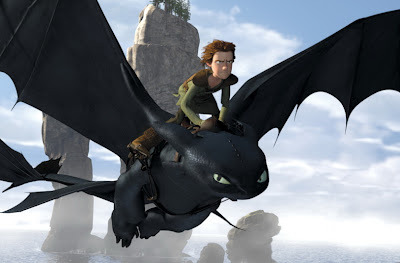 Toothless, Hiccup’s dragon, is unlike any other dragon I’ve seen on screen. His movements are quite catlike and it has the desired effect of making the dragons seem more pet-quality than you might think. The script, however, is “Dragon’s” real strong point. Writer William Davies gives the story proper pacing and allows for authentic emotion, something that is often lacking in any movie, let alone an animated one. The bond between Hiccup and Toothless is reminiscent of dog and owner, and that comes across naturally rather than relying on the cliché play-up that so many movies resort to. The two work together as Hiccup tries to fix Toothless’ broken wing and Toothless in turn teaches Hiccup about dragon psychology, something no Viking has bothered to study. It’s an authentic relationship that these two share not only with each other but with the audience as well. The dialogue is full of humor and wit, never leaving the viewer wanting for comedy on top of everything else. Overall, “Dragon” is an extremely original story that is brilliantly told. “Dragon” is a major step forward for Dreamworks animation. Their previous films (“Shrek,” “Flushed Away,” etc.) have done well at the box office but have failed to garner the critical attention that the Pixar films have. For me, this has always been because where the Pixar movies connect on an emotional, relevant level, Dreamworks features simply aim to make the audience laugh. There’s nothing wrong with that, par se, but great movies connect, not just entertain. “Dragon” manages to connect and entertain along the same lines as some of the better Pixar films. It is 98 minutes of pure imagination in cartoon Viking form and leaves the viewer wanting more from the inevitable franchise that is to come.